Stratton weekends&weeknights now available. Great getaway-shuttle-sauna-hot tub! Wonderful family ski house with beautiful view of Stratton Mountain. Large living room with a central fireplace is a great gathering place after a hard day of skiing. Dry sauna provides warm relaxation comfortably for four. Shuttle bus service from bottom of driveway will take you to the mountain in four minutes. Eight beds will sleep eleven. Dining area adjacent to full kitchen. **A 4-6 person hot tub sits outside with direct viewing of Stratton Mountain. This luxury tub will relax you while you enjoy the crisp outdoors and the sounds of nature. Pets welcome with approval from owner. Quiet nights away from groomers and traffic with night views of fireworks and spectacular starry nights without light pollution. Walk to the cross country ski trails on Stratton golf course within 600 yards. Moonlight touring is spectacular. Health Club Available: The rental allows you access to the Stratton Health Club for a guest fee of $10.00 a person a day. Mountainview. Hot tub. Sauna. Shuttle to mountain. Less than 1 mile to base lodge. Access to health club by purchasing $10/day pass from owner. Base of mountain is 800 yards as the crow flies. View is amazing. Towels and sheets are provided so that you do not need to bring your own. The cost is deducted from the security deposit and averages about $100-$130 per week/weekend over and above house rental cost. Really nice place only a 1 minute drive from the mountain. I would definitely recommend. We had a wonderful long weekend stay. We only needed 3 out of 4 bedrooms for 2 adults and 3 kids because there are so many beds. The views are lovely of the mountain and the woods. Hot tub was wonderful to relax after a long day skiing. Everyone fell in love with an oversized chair in the living room - the whole set up was great. I would give it 5 stars, but it wasn’t as clean as I’d hoped. Evidently there had been too much of a gap in time since the cleaner was there. It wasnt awful - just disappointing that the hot tub wasn’t clear upon arrival. After putting in chlorine it cleared up the next day. I would also suggest they get some new pots and pans. But besides that - it was a fantastic house! Jim was incredibly gracious when my son got the flu - allowing us to check out late. He also went out of his way to have the cleaner check twice for lost items which is very much appreciated! Highly recommend!! Will definitely return! 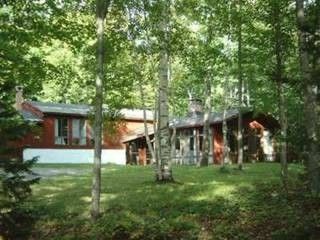 This a great ski house - five minutes from Stratton - comfortable and large enough for us to spread out. The shower in the Master Bath was fun...it had a wall of glass looking out on a forest. Everyone loved the Hot Tub and we used it everyday in 5 degree weather. We had a problem finding the house when we first arrived in a blizzard!! The house number was wrong on the VRBO site but we found it with the help of the neighbors. The house could be updated - if your in to that - but overall we were happy to have a few days of skiing. A very cozy and welcoming property! This house is the perfect weekend getaway! We stayed for two nights, and really enjoyed our stay. The house was large enough to accommodate our group of 10, and the hot tub was enjoyable after a long day of skiing. Everything was clean, and we were provided with detailed directions that made for a seamless arrival and departure. Jim was attentive to all of our questions. We would absolutely stay here again! Stratton Village at the base of the mountain offers restaurants and stores of incredible variety. Manchester Outlets, 15 miles away, offer the best of outlet shopping in the Northeast. Many fine restaurants within driving distance. Bromley and Magic Mountains are each ten miles away. Linen service cost is deducted from security deposit. Ski: 2 minutes from the house on the weekend/holiday shuttle bus or driving, you will find superior skiing at Stratton with incredible uphill lift capacity and expert snow making. New gladed trails provide expert terrain for the adventurous. Bumps and groomers and long cruisers make your ski day fun for all levels and abilities.